As teenagers grapple with the reality of maturing into young adulthood, a single reaffirming gesture can go a long way for youth who are struggling with insecurity. Similarly, a gesture of the same magnitude – but in an opposing direction – has the power to shatter a delicate web of confidence. Now imagine that degenerative moment being broadcast over national television. That show has a name, and it airs weekly at primetime on MediaCorp‘s Channel 8. “Hey Gorgeous” first aired on Channel U in 2007 as “校花校草追赶跑” (“chasing attractive students”), before undergoing a name change in 2013 to “校园美魔王” (“wickedly attractive students”). The new name stuck when the show moved to a primetime slot on the flagship Chinese-language station Channel 8 in 2015, with the current season still ongoing. The programme lists MediaCorp artistes such as Carrie Wong, Somaline Ang, and Chase Tan as its beneficiaries, having been “discovered” by the crew and deemed worthy of a glitzy life in showbiz. Let’s start with the show’s title: “Hey Gorgeous” isn’t anywhere near bashful about its motives and intentions. The current season is hosted by Dasmond Koh, Ben Yeo, Vivian Lai, and Kate Pang, and is touted as a variety programme featuring “campus invasions to headhunt the most gorgeous faces in Singapore’s tertiary institutions”. Pretty simple, yes, but innocent it is not. In the second episode of the current season the crew took to Temasek Polytechnic (TP), eager to make the days of a lucky few. The show’s hosts are cheery and energetic, and are familiar faces on TV. With cameramen in tow, they make quick work throughout the compound, rounding up students they deem pleasing to the eye. The first hint that something is amiss with this show comes just 10 minutes into the episode. After “cornering” a lecturer at a common table, the staff member divulges her students’ particulars and administrative headshots to the hosts, who make snap judgements based on their looks in pixellated thumbnails. The lecturer even takes it one step further by calling her students and asking them to come to the show’s taping. How ethical is this exactly? Granted, the students could have turned down the offer (more of an instruction than anything) and the segment would have been edited out of the show entirely. Unfortunately, content that should have been edited out were not. The show’s Mandarin medium would explain its predominantly Chinese cast of showbiz hopefuls, but that does not justify the hosts’ internalised beauty ideals, especially those stemming from cultural notions. 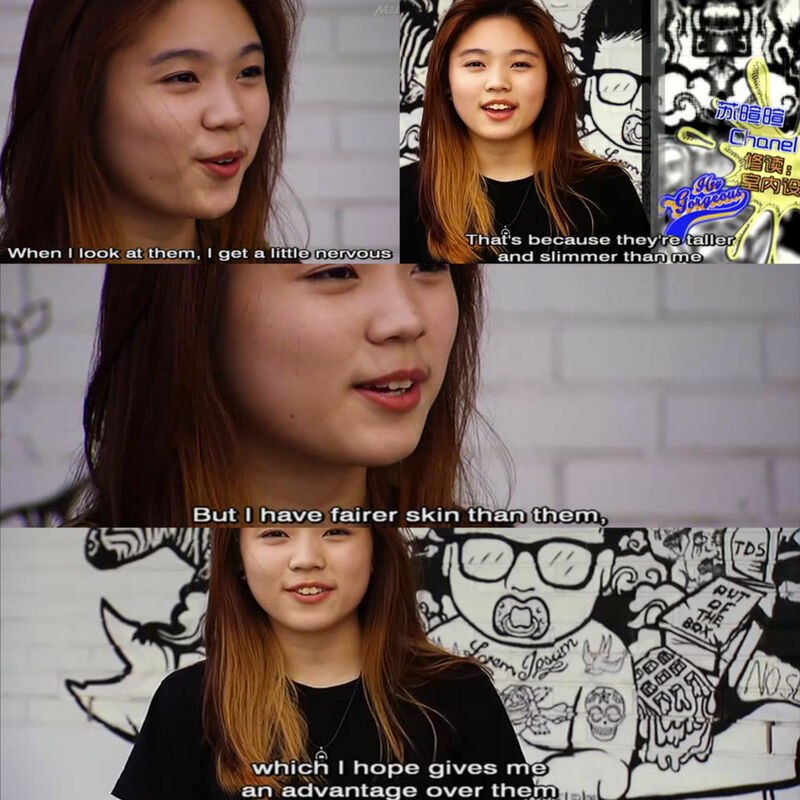 While the personal harbouring of a beauty ideal is usually only damaging to the self, acting upon these mindsets on national television is equivalent to a public service announcement or a nationwide education drive telling (young) Singaporeans that superficial traits are the only qualities that matter. This glaring viewpoint is apparently also shared by the show’s production team, as comments made by a contestant about her competitors’ bodies, figures, and complexion were all deemed to be fit for public consumption and not left on the cutting room floor. But in all fairness, how politically correct can a show that’s framed on superficial looks alone be? The true issue here lies in the executive decisions behind the programme. That these controversial remarks were allowed on television reveals an utter disregard for those who do not fit the “traditional” definition of beauty. After Cosmopolitan Singapore‘s poor judgement in a similar context back in May 2015, have we not learnt anything? Also, why is there a need to pit youth against one another? Healthy competition for sporting achievements or artistic excellence spurs determination and other positive qualities, but physical attractiveness should not be the sole basis of a contest, especially not for contestants of such a young age. Keep in mind, this programme was aired during a weeknight, where family-friendly content draws viewers of all ages. The danger of these few sentences and its effects on the minds of impressionable youth cannot be stressed enough. If “Hey Gorgeous” is truly set on discovering new talent to enter the showbiz industry, I believe there are better ways to go about achieving this without making those who fall outside this specific set of criteria feel bad about themselves. The ends definitely do not justify the means in this case, and with the changing definition of celebrity today, MediaCorp might want to reconsider their ethos. What’s a pretty face when that’s all there is?